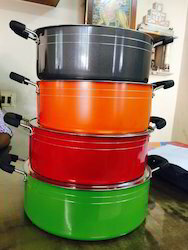 We are offering Non Stick Casserole to our clients. With cover & small side handles thickness 5mm. • Classy, elegant and regal casserole with German beechwood handles and knob. • Finest quality in die-cast aluminium with 5mm thickness. Capitalizing on the ability of our skilled personnel, we are keenly instrumental in delivering a comprehensive array of Regular Casserole. Available in approx. 1, 2, 3, 4, 5, 6, 8, 10, 12, 14 & 16 liters capacity denoted no. in same sequence, diameter range from 140 mm to 300 mm. Available in plain & thick borders model. We are a leading manufacturer and supplier of Aluminum Deep Casserole to our valuable clients.